This is the “OH NO” moment when your reel is screeching…your arms are aching…your rod is bent when you see the big monster 45-pound dorado and you realize you only have 30-pound equipment! Becky Csutoras took this great shot of her dad’s fish as it made that big jump. Yes, he did get the fish. See the tired angler below…he fought it for 45 minutes! Don White always does well. He was just off Punta Perico with Captain Pancho when he tied into this baby blue marlin. Happily released! Check out the video below of the unceremonious, but successful release. The marlin was not complaining. Congrats to our amigo, Don, who visits from Oregeon each year! Becky Csutoras, is normally travellng all over the country as an accountant, but she takes some time each year to get in some fishing with us at Tailhunters. She has to be one of the happiest fisher people we ever see. 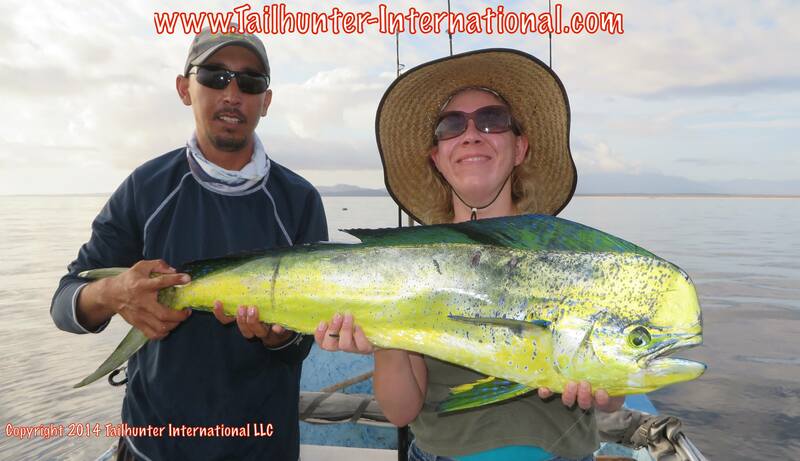 Every day is a “GREAT DAY!” Check our this fine dorado she caught off Las Arenas! She did well all week! Start ’em young! 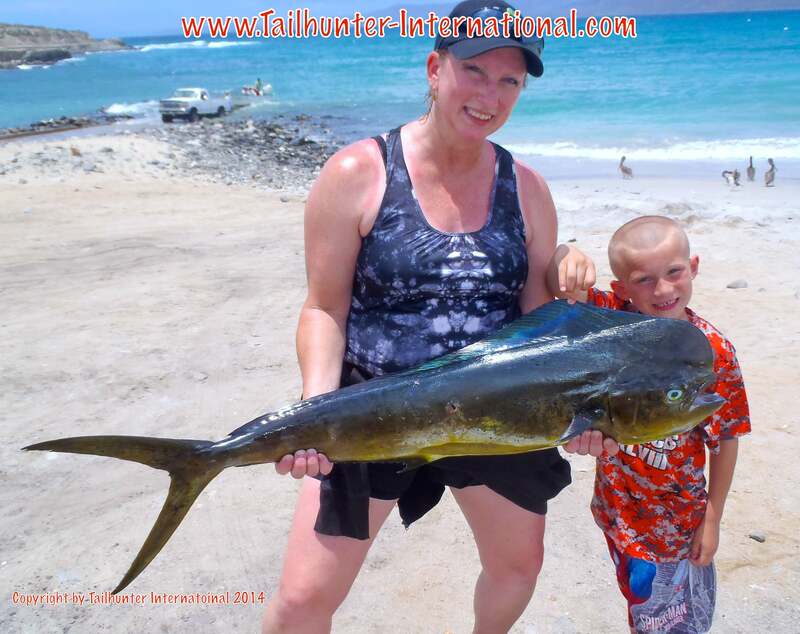 Six-year-old Roman, gets a hand from his grandma, Kelly Jimenez, with a nice bull dorado standing on the beach at Bahia de Los Muertos. “Romo” had himself a great time all week helping grandma and grandpa to fish! John Russell told me, “They fight harder than salmon!” He used to be a salmon fishing guide. Visiting us from Milpitas CA, he put the hurt on this colorful big bull dorado fishing near Espirito Santo Island north of La Paz. Great colors…big fish! My old classmate from law school, Skip Coomber in the center with friends and family got out for a day even during the ugly cloudy weather and got a few dorado. Skips daughter, Amelia, in the gray t-shirt is with her girlfriends Haleigh and Isabella…all 3 girls on a last hurrah before staring their respective college careers in several weeks! She never fails to get big fish! 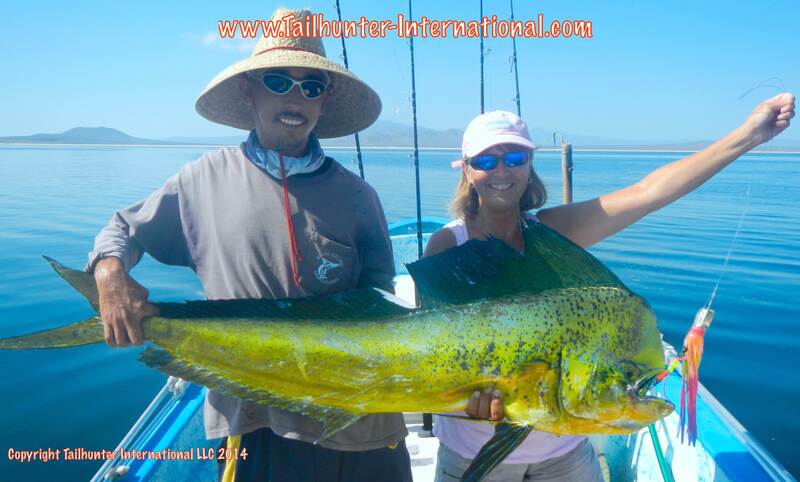 Oregon in the house, Debbie White in flat water with another big dorado on her scoreboard! Punta Arenas in the background. Each year, Debbie makes us the best homemade moonshine “Apple Pie” for our Oregon show. 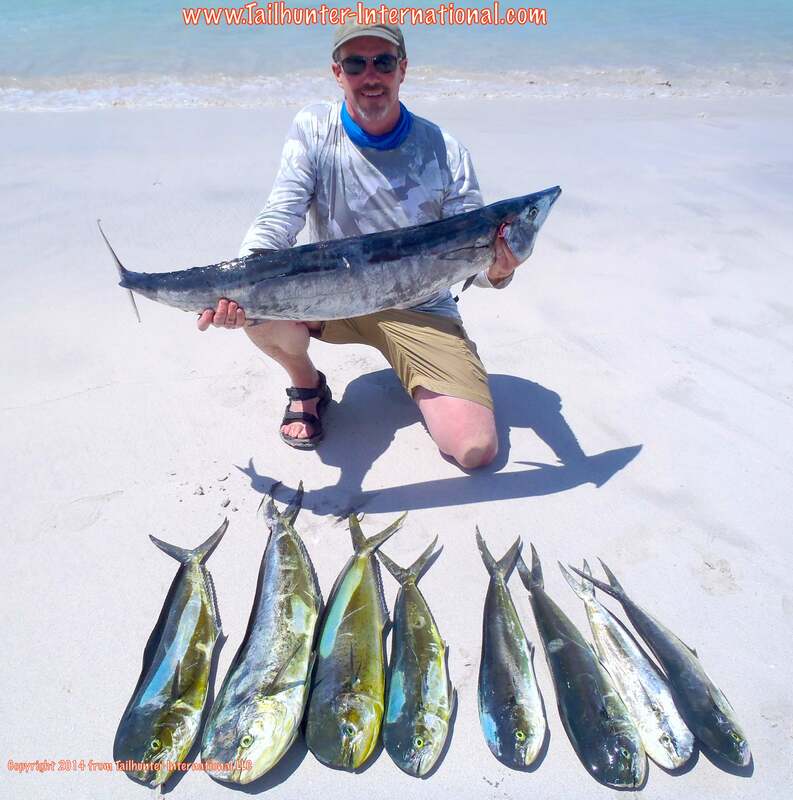 John Gothie had just a few days to spend with us, but made the most of it with a nice wahoo plus some fun dorado while fishing with Captain Adolfo and our Tailhunter Las Arenas fleet. Another youngster headed to college for the first time…Brian Russell will be headed to Arizona State in just a few weeks, but got his first striped marlin here with our Tailhunter Las Arenas fleet. Rain cells moving through the area and bringing a mix of some thundershowers, drizzle, wave surge and winds marred some of the fishing. Fortunately, it wasn’t a hurricane, but just some tropical storms. In most cases, the rain didn’t get anyone wet until the afternoons when the fishermen were already back and it really cooled things off, but it did rob sunshine from vacationers looking for more sunshine than we got this week. It was very tropical. It could rain for 5 minutes or two hours. It could rain on one spot but then 200 yards away, it would be bone dry. An hour later, it would change again. Or not rain at all until the next day. 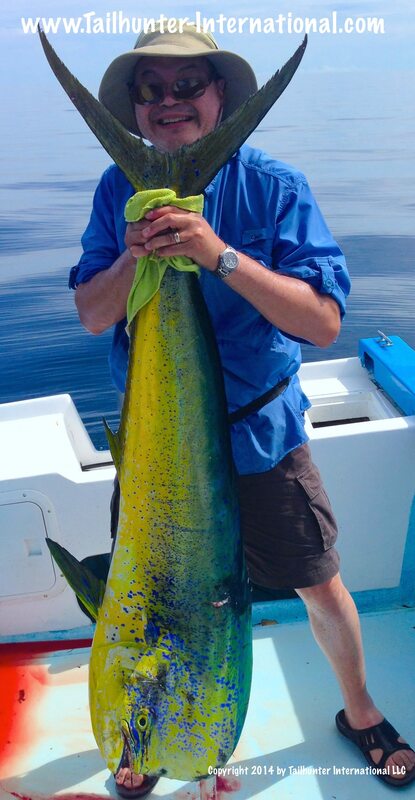 Again, the most cooperative species were the dorado. 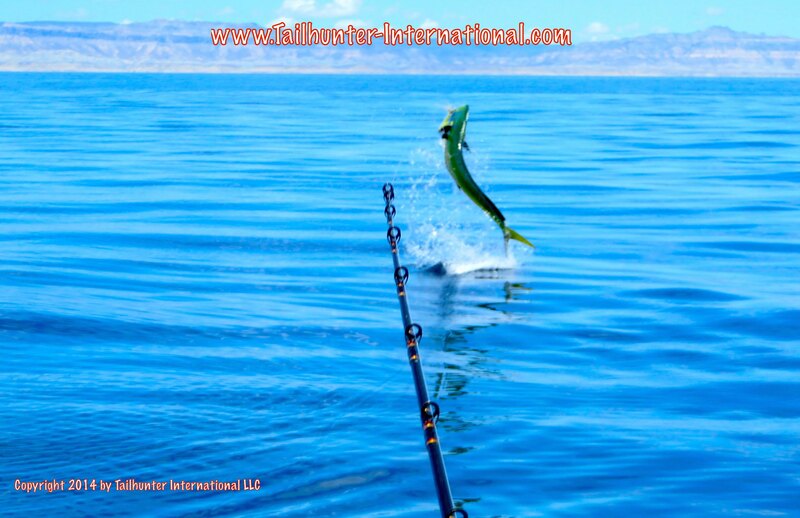 Both our Tailhunter Las Arenas fleet and our Tailhunter La Paz fleet had some good results that differed from day-to-day and boat-to-boat. At Las Arenas, there was again, no shortage of little firecracker 3-10 pound dorado. Some days, all you wanted. 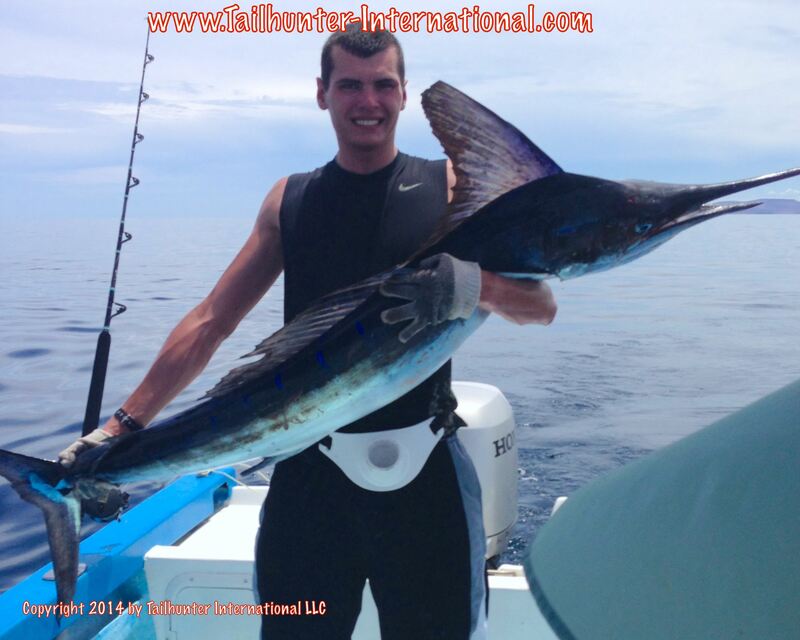 There were some billfish hooked and we did get a few wahoo and pargo. The big roosterfish are still around, but most of the focus has been on the bluewater species. The week started OK, but then the skies would darken and each day, the winds and waters got a little rougher as we got the tail end of the storm and the periphery of the rain. At least, there wasn’t alot of wind, but it still wasn’t real comfortable towards the end of the week. We actually, had most of our fishermen move over to fish with our La Paz fleet where the fish were at least a big larger. 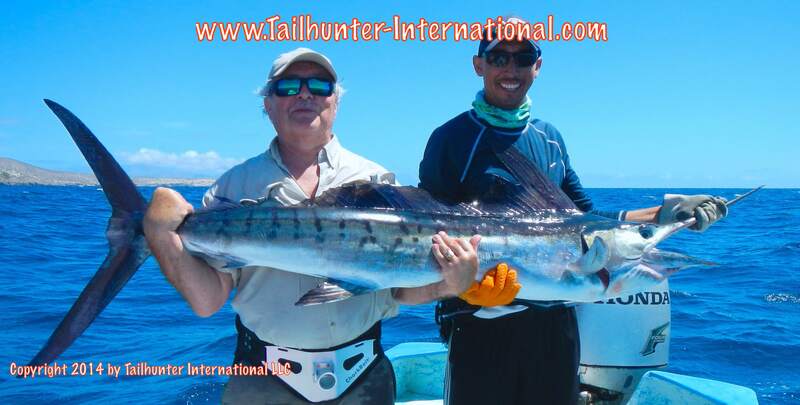 For our Tailhunter La Paz fleet, the dorado were a bit bigger and went normally 10-30 pounds and were in areas scattered around Espirito Santo Island and the western side of Cerralvo Island. After the storm clouds moved off, waters went back to calm and flat pretty quickly. We did get some dorado up to the 40-pound class and other large ones lost. 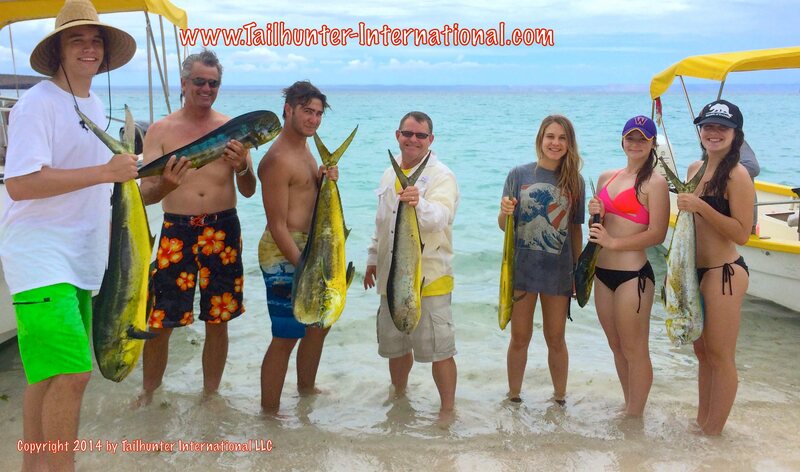 Billfish were also in the area with most fish getting released. Decent live caballitos for bait. Keep an eye out. There’s alot of sealife out. Turtles…manta rays…whale sharks…blue whales were all seen this week! Water’s 85 degrees. Jump in! According to the forecast, we’re gonna get a little more rain at times at least through next week. But, every day the forecast changes. As of writing this, there’s not a cloud in the sky and it’s brilliant sunshine and now they are saying no rain! Just come fish!